From AARP: There’s a lot to love about fall: crisp air, apple cider, football games, and even those leaves piling up on your front lawn. That’s because raking leaves gives you a perfect opportunity to get outside, get some fresh air, and get in a workout — all at the same time, not to mention that your yard will look great when you’re done. Raking leaves is considered moderate physical activity, similar to a brisk walk, according to Barbara Ainsworth, an exercise epidemiologist at San Diego State University. It helps build upper-body strength, as well as core strength, or strength in your back and stomach. As you’re raking, your core (or trunk) is working to stabilize your body while your arms are moving, says Ainsworth. 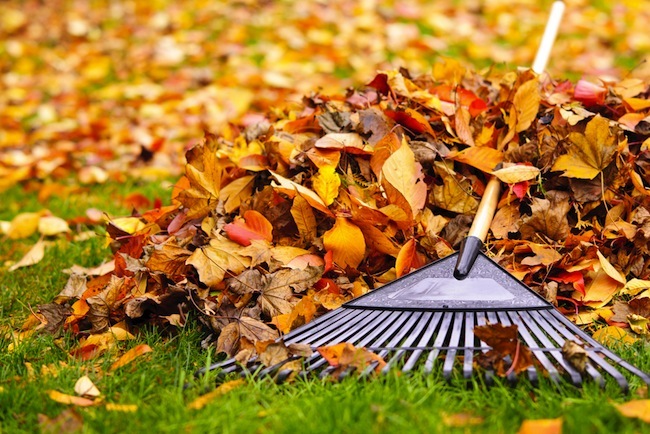 A 135-pound person could burn about 240 calories raking leaves for an hour. Wear layers. It might be cool when you first head out the door, but you’ll work up a sweat after you’ve been raking a while. You can peel off a windbreaker or jacket so you don’t get overheated if you’re wearing a sweatshirt or sweater underneath. Warm up. As with any physical activity, you should warm up your muscles before you start working them. Raking uses muscles in your arms, chest, shoulders, legs, and upper and lower back — almost all the muscles in your body, says James Weinstein, chairman of the Department of Orthopedics at Dartmouth Medical School. Try walking around the yard, doing some circular arm movements, bending forward and backward, and to each side. You can follow that with some gentle stretches. Stand and move correctly. Pay attention to your raking posture. Weinstein recommends forming a wide base with your feet and holding the rake slightly toward the end of the handle with one hand and three-quarters of the way down the handle with the other. Be careful not to twist your spine. Instead, move your whole body (think of a rotating chair), not going farther than your feet will allow. Keep your back naturally aligned — try to stand as straight as you comfortably can. Switch sides. People tend to rake on one side of their body, which increases the risk of injury since raking uses the same muscles to do the same movement over and over. To avoid overuse injury, try switching sides every few minutes. 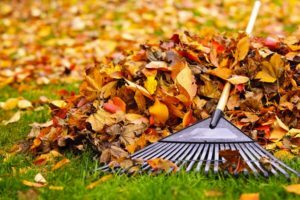 Try raking 10 minutes left-handed and another 10 minutes right-handed, suggests Boyd Buser, associate dean of clinical affairs at the University of New England College of Osteopathic Medicine. This will help balance out the stress and strain to the lower back that happens from pulling off to the side instead of directly in front of you. It also distributes the strain on your arms and shoulders evenly on both sides. Take it easy. Take your time, especially if you don’t normally do yard work or aren’t very physically active. Don’t try to rake the whole yard at once. Stop and take a break after 10 or 20 minutes. Have some water and do some stretching. The breaks give the muscles you’ve been using repeatedly a chance to relax. Cool down. When you’re done raking, do some more stretching to help relax tense muscles. If someone offers to give you a massage, say “yes.” A warm bath works, too. Don’t lift bags with your back. Bend your knees and lift with your leg muscles. Don’t overfill bags so they become too heavy to lift. Try dragging the bags or using a wheelbarrow if you have to move them long distances. If you’re using a tarp and dragging leaves to a curb, don’t overload it. And don’t twist your body when you’re pulling the tarp. If possible, have someone grab an opposite end to help you move the leaves. Don’t be a weekend athlete and try to bag all the leaves at once. Pace yourself and tackle leaves in several sections. Better yet, save the bagging for another day since you put your back at greater risk of injury by lifting right after raking. Too many leaves to bag? As an alternative to bagging, consider composting your leaves or using them as mulch to cover your garden for the winter. Stay dry. Rake leaves when they’re dry. Wet leaves are heavier, harder to rake, and more slippery. They also can breed mold and mildew, which can make raking unpleasant for allergy sufferers. Watch your footing. Wear shoes with good traction and support to keep you from slipping and falling. Good foot support will also keep your back from tiring as easily. Be aware of your surroundings. Be careful of holes in the ground or objects you can trip and fall on, such as rocks, branches, roots, buried garden tools, or misplaced hoses or lawn ornaments. Heed nature. Look out for insects (especially the stinging kind) and snakes or other critters that might have made the leaves their home. Wear gardening gloves to protect your hands. If there is mold on leaves, trees, or elsewhere in the yard, consider wearing a mask if you have allergies. Raking leaves is not only good exercise for you, it’s good for your lawn; grass that’s covered with leaves can’t soak up sun, which it needs to grow. Raking also will make the outside of your house safer and prettier. So add raking to your physical activity list and welcome those falling leaves!